Funny how people will search high and low for a screamin’ deal or a bargain, even braving the gauntlet of Black Friday at Walmart and then overlook one of the simplest money saving tactics available – turning off their engines instead of idling. And since this is California and not the frigid climes of Alaska, people aren’t idling to warm up their engines. They’re idling at the bank, the fast food restaurant, the driveway while chatting with the neighbor, in the supermarket parking lot with the air conditioning on full blast while talking to their mother on the phone, and of course, in gridlock traffic on the freeway. Idling is commonplace, and seemingly harmless, but besides costing you money that adds up over time, it impacts the longterm health of your engine, kicks out unnecessary exhaust into the atmosphere, and is also just plain and simply kind of wasteful. In a 2017 article in Popular Mechanics, author Jay Bennet states that, “The long-held notion that you should let your car idle in the cold is only true for carbureted engines. The common wisdom is that when you are gearing up to take your truck (or vehicle) out in the cold… you should step outside, start up your engine, and let it idle to warm up. But contrary to popular belief, this does not prolong the life of your engine; in fact, it decreases it by stripping oil away from the engine’s cylinders and pistons. Engines with electronic fuel injection have sensors that compensate for the cold by pumping more gasoline into the mixture. The engine continues to run rich in this way until it heats up to about 40 degrees Fahrenheit.” Idling with the AC on – a common occurrence in California to weather the extreme summer heat – may be detrimental to your engine if your radiator system is somehow compromised, potentially causing the engine to overheat. At an estimated 6 billion gallons of fuel wasted annually across the country as a result of engine idling, using California’s current fuel average of $3.73 per gallon ($0.85 above the national average), that equates to over $22 billion dollars of fuel used to cover approximately zero miles in distance. It is said that idling is “money out the tailpipe,” and this fuel waste can burn up a company’s bottom line needlessly. Besides the obvious loss of money from unnecessarily burned fuel while idling, the impact on an engine can also add up over time. In terms of engine wear, according to Idle Free California, “For every two minutes of idling, one mile could be traveled… (and these) ‘Ghost miles’ accumulate on an idling engine… (creating) engine wear and carbon soot buildup in the engine and components.” To offset these effects, many companies have installed engine idling and GPS tracking systems in their fleets of vehicles and trucks to make sure that drivers are not idling unnecessarily. In addition, an unknown number of municipalities have ordinances banning drive-thrus to reduce vehicle idling. 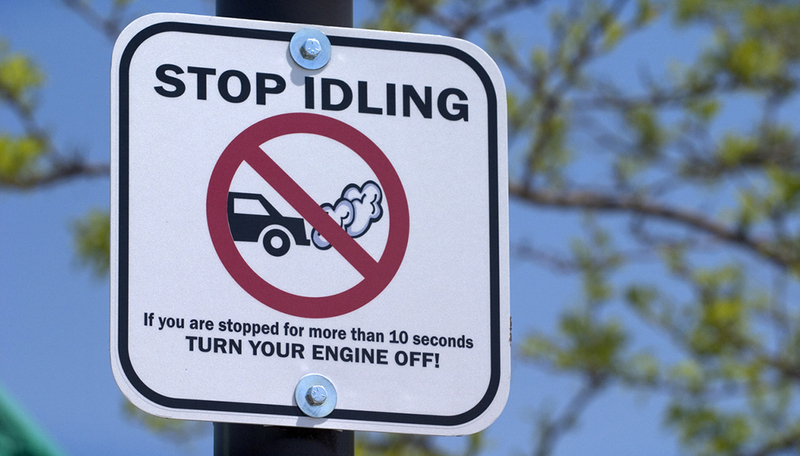 The US Department of Energy has recognized as part of their ongoing studies in national idle reduction a list of states that adhere to idling restrictions. These states include Connecticut, Hawaii, Massachusetts, Maryland, New Hampshire, New Jersey, and Vermont for all vehicles and California, Delaware, Maine, Nevada, New York, Oregon, Pennsylvania, Rhode Island, South Carolina, Virginia and West Virginia for commercial diesel and/or all diesel vehicles. 12 additional states have jurisdictional idling regulations. By understanding the financial and environmental impact of unnecessary engine idling you can make the choice to switch off your engine instead of burning expensive fuel and incurring extra wear and tear on your vehicle. As fuel prices continue to rise, every dollar counts. An easy cost savings remedy is to shut down your engine the next time you find yourself at the bank, the drive thru or even in your own driveway.